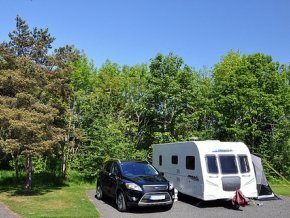 We stayed at River Breamish CC over the bank holiday weekend at the end of May. River Breamish CC lies just north of Powburn and just off the A697. Our pitch was (very) hard standing, the drill struggled quite a bit. Arriving there on the Thursday for an early start, we found that lots of other people had the same idea, as the site was fairly full. The site is a mixture of grass and hard standing pitches. 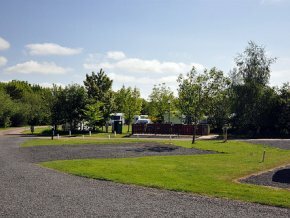 The Caravan Club brochure tells us that there are 79 pitches, 47 of which are hard standing. Emphasis must be placed on the hard part; my drill did struggle in the hard packed slate and shale. 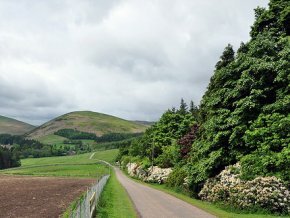 The delightful River Breamish runs along the top of the site and can be accessed directly from it. There are also two small lakes and around all of this meanders the largest dog walk I have seen on any CC site. River Breamish CC has a mixture of grass and hard standing pitches. The site has cul-de-sacs of pitches which are liberally interspersed with small areas of low growing shrubs, grass and trees which form borders. These give the site a very woodland feel. Indeed, woodland birds abound here. On an evening the bats come out and in the dusk you can watch them flit about for their supper. 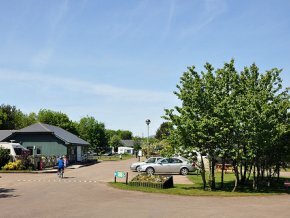 The site has a wide open access with visitor parking, then a small office and shop. I found the wardens friendly as usual, and it is obvious that they work hard to keep the site spotless. The facilities block is also very good and very clean but there is only one; situated approximately halfway along and to the south end of the site, so it can be a walk from some of the outer pitches. Wide open access, visitor parking and friendly wardens were all welcome. The little shop on site sold us some of the necessities needed for our stay including ice creams and tea bags (and ice creams again!). For other necessities there is a well stocked Londis garage shop at the end of the road. The countryside around the area is wonderful, unspoiled and very quiet. We drove out on the Saturday morning into the country lanes, exploring, and it was nearly half an hour before we saw another vehicle. 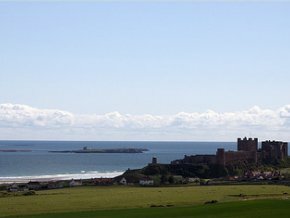 There is a load to do around here with castles, battlefields, waterfalls, beautiful hidden valleys and the Farne Islands. Linhope Spout waterfall lies just up the Ingham valley and if you like a walk, it is nice to visit. Our trip to the Farne Islands was truly magical. Our weekend highlight was most definitely our visit to the Farne Islands, which are just off the Northumberland coast and accessible by boat from Seahouses. We enjoyed a two and half hour tour which included an hour on Inner Farne. There are between 15 and 20 (or more) islands depending on the state of the tide. The islands are divided into two groups, the inner group and the outer group. The two groups are separated by Staple Sound. The islands are home to over 100,000 pairs of nesting seabirds such as puffin and guillemot; we all loved the puffins. There is also a large seal colony with some very friendly seals and this is the location of the daring sea rescue by Grace Darling in 1838. The islands are looked after and controlled by the National Trust and there are several boat companies licensed to land on the islands with landings including Staple Island and Inner Farne (weather permitting). Our trip to the Farne Islands was one of those magical days that don’t come along very often. Header banner image credit to dave souza [CC BY-SA 4.0 (https://creativecommons.org/licenses/by-sa/4.0)], from Wikimedia Commons.